Map showing the Tasmanian Wilderness World Heritage Area. The Tasmanian Wilderness World Heritage Area is a World Heritage Site in Tasmania, Australia. The area is one of the largest conservation areas in Australia, covering 15,800 km², or almost 20% of Tasmania after extensions in 1989 and 2013. It constitutes one of the last expanses of temperate wilderness in the world, and includes the South West Wilderness. The Tasmanian Wilderness, a network of parks and reserves with steep gorges, underwent severe glaciation. Human remains dating back more than 20,000 years have been found in limestone caves in the area. Despite advising the UN World Heritage Committee (WHC) in 2010 that it had no intention to extend the property any further the federal labor government submitted a proposal for a minor boundary modification (MBM) to the property in January 2013 which was accepted at the 37th session of the WHC in June 2013. Former Greens Senator Bob Brown, claims to have secured the government backflip on extending the property further, using the Greens political leverage in minority Labor government and with holding the balance of power in the Australian senate following the 2010 election. The underpinning science used to justify the MBM was that generated by the 2011/12 Tasmanian Forest Agreement (TFA) Independent Verification Group (IVG). This group was jointly appointed by Tasmanian and Federal governments to verify claims of high conservation value in 572,000ha of reserves proposed by the TFA environmental signatories The Wilderness Society (TWS), The Australian Conservation Foundation (ACF) and Environment Tasmania (ET). The Terms of Reference for the Verification group issued by the former Prime Minister Julia Gillard explicitly required those involved in the IVG process to be independent of government and all other stakeholders. The IVG process validated all the TFA ENGO claims as did the peer review. Public concerns were raised about the independence of the IVG's work in 2012/13 with former World Heritage Centre Director, Mr Kishore Rao, who subsequently wrote to the Australian Government in early 2013 requesting clarification on the independence of the IVG's work. The Australian government response stated that the process and academics involved were independent. Subsequent information released under Department of Environment FOI during 2014-16 revealed that many involved in the IVG process failed to comply with the Terms of Reference and were substantially affiliated with TFA signatory ENGOs – including holding senior positions within those organisations or having received substantial payments from these very organisations. Even the "independent" peer review scientist had clear links to the Wilderness Society. This scientist, Professor Reed Noss, was the co-founder of the US based Wildlands Project of which The Wilderness Society is their Australian partner, implementing Wildlands concepts in Australia. Wildlands co-founder Michael Soulé was on the Wilderness Society's Wild Country Science Council as was IVG lead scientist Professor Brendan Mackey.. The released FOI information showed that no conflicts of interest were declared in this regard and that although the Department of Environment was completely aware of the conflicts, they chose not to rely on conflict of interest clauses in contractors contracts or held a single document on either the declaration of or the management of conflicts of interest. In 2014, the Abbott Government proposed de-listing the Tasmanian Wilderness as a World Heritage Site so as to allow the logging of trees within the protected area. If successful, the proposal would have marked the first time a developed nation had de-listed a site for economic purposes. The proposal was rejected by the 38th Session of the World Heritage Committee in June 2014, which met in Doha, Qatar. The Abbott Government has since stated it intends to respect the decision of the committee. Other controversial environment related projects spearheaded by the Abbott Government include the Great Barrier Reef dredging project. In 2016, the Tasmanian government withdrew the bid to allow logging in the Tasmanian Wilderness after a UNESCO report opposed the idea, despite UNESCO World Heritage procedures  allowing for such an activity and the WHC approving a much higher level of timber harvesting in another WH property – Gros Morne National Park. ^ World Heritage Centre. "World Heritage List". UNESCO. Retrieved May 2, 2012. ^ Parks and Wildlife Service Tasmania. "Tasmanian Wilderness World Heritage Area". Tasmania Online. Retrieved May 2, 2012. ^ United Nations Education; Scientific and Culture Organization. "Tasmanian Wilderness". UNESCO. Retrieved May 2, 2012. ^ "State Party Report on the State of Conservation of the Tasmanian Wilderness World Heritage Area 2010" (PDF). April 14, 2017. ^ "Wilderness Society". April 15, 2017. ^ "Unesco to rule on Tasmania forest and Great Barrier Reef". BBC. 15 June 2014. Retrieved June 16, 2014. ^ Glenday, James (24 June 2014). "Federal Government will respect UN committee's Tasmanian forest ruling". ABC. Australian Broadcasting Corporation. Retrieved 11 December 2014. ^ Darby, Andrew (31 January 2014). "Abbott government to cut 74,000 ha of forest from World Heritage zone". The Sydney Morning Herald. Retrieved 16 August 2018. ^ "Australia drops Tasmanian Wilderness logging campaign". BBC. 20 March 2016. Retrieved 20 March 2016. 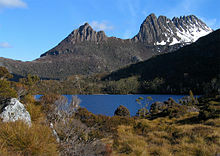 Wikimedia Commons has media related to Tasmanian Wilderness World Heritage Area. This page was last edited on 18 January 2019, at 22:40 (UTC).